Whether you’re a strict follower of the KonMari method, dedicating yourself to a seasonal capsule wardrobe, or are simply trying to tackle the overflow, the best storage containers for clothes can come in very handy indeed. Keeping your clothes contained (so to speak) is not just important for making sure you can find everything when you need, but also protects your favourite items. There’s an option here for almost all clothing storage needs. For shelves, wardrobes and under high beds – heck, for any room of the house, if you like – our top choice is The White Company’s Kubu Multi-Purpose Basket, a rustic hand-woven basket which fits in almost anywhere. For long-term storage, consider a condensing vacuum bag like those from Packmate, or a large capacity plastic clip container like the Really Useful Box. And that’s not to say that they have to be engineered for purpose, either. In fact, some of the most helpful and attractive clothes storage options can be found in the most unexpected places. 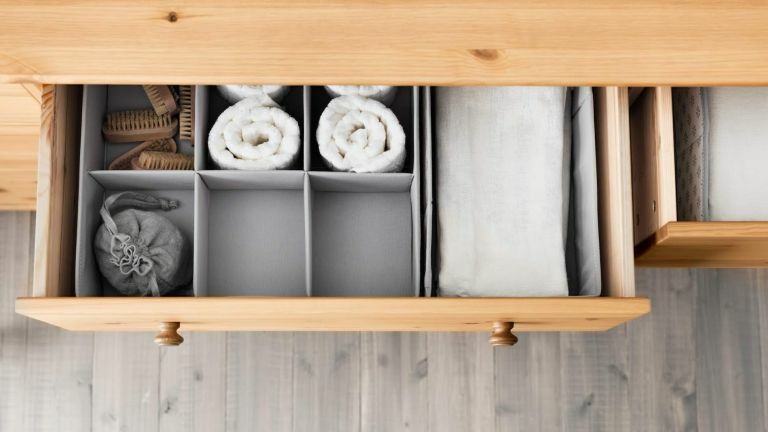 If you don’t have a drawer unit in your bedroom or dressing room, or you do and your clothes need even more corralling, individual storage baskets are a very attractive option. These square baskets from The White Company are ideal for small items like folded t-shirts and lingerie, although you may want to be careful with very delicate items as the rustic handwoven finish means there could be scags on the horizon. Nevertheless, these artisanal baskets look wonderful, with their washed grey tone, and the cutout handles make for easy access in the fog of the morning. For those with sentimentally valuable but little-worn items to store, or capsule wardrobe pioneers looking to pack away out-of-season clothes with the minimum of fuss, these vacuum storage bags can come in incredibly handy. Said to reduce size by up to 75 per cent, they’re ideal for bulky items like big winter jumpers or gowns, or even duvets and other bedding, and the resulting flat bag it set to be much easier to store under beds and in cupboards than boxes. The vacuum seal means you don’t need to worry about moths, damp, or odours either, common concerns when it comes to long-term clothing storage. Under-bed storage solutions can be somewhat lacking in variety, and you may find yourself labouring over which variety of clippable plastic box to go for because of this. However, Next have come up trumps with these under-bed storage baskets, which will suit those after an option that better fits in with their bedroom’s aesthetic down to the ground. Granted, it’ll cost you more than a no-frills clear plastic option, but the rustic look of the woven willow and faux leather handle (available in on-trend grey or natural) make it worth it. End-of-bed storage needn’t be all about open-front rails or assorted boxes. For a luxurious look, nothing beats a bench or ottoman, and this one from Oliver Bonas has both style and substance to spare. As well as offering convenient bedroom seating – perfect for grappling with tricky sandals pre-outing – this storage ottoman’s capacious interior provides a home for overflow clothes and blankets. Aside from that, it also looks magnificent, with a tactile velvet covering, complete with button tufted details and a huge range of colour options. It’s an unspoken rule that every household must have at least one Really Useful Box, despite no-one ever really being sure where it came from. And it’s little wonder: they’re budget-friendly, stackable, practical and hard-wearing, making them fantastic for children’s toy storage and long-term clothes storage, whether for you that means stashing sentimental items in the loft or keeping bulky coats out of the way until the temperature drops again. They come in a range of sizes, although this extra-large 84-litre box is ideal for storing lots of items long term, or tall and inflexible items such as hats, helmets and boots. Shoes are among the most common culprits for clutter in the home, so to save the hallway or the bottom of your wardrobe the strife, consider going for a specially tailored option like these fabric shoe boxes from John Lewis’ House collection. Keeping pairs carefully corralled, and thus ensuring you’ll never again end up with two lefts from very similar-looking pairs of heels when you’re in a rush, they feature a translucent mesh front that keeps things looking tidy when they’re not in use, but is also easy to lift up to get at the exact pair you need. The temptation with chests of drawers can be to simply toss everything in there and hope for the best, but this inevitably results in tangled up tights and playing Snap with your socks. In-drawer storage like these fabric boxes from Ikea may be the answer, and with a set of three, there are enough configurations to be a reasonable catch-all. The long single-compartment boxes are ripe for experimentation, although for our money, the six-part boxes would be ideal for notoriously tricky-to-keep-tidy underwear or belts.